A Kids bedroom is the perfect place for a High Sleeper Bed allowing plenty of headroom underneath and storage space for toys, drawers or computer workstations etc. High Sleeper Beds are ideal for the grown up kid! With lots of space and headroom underneath the bunk for seating, computer workstation or drawers. 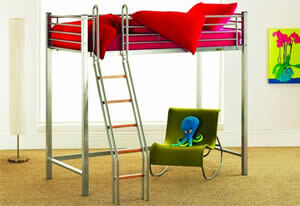 A ladder is still required to get into the top bunk, unless your children are energetic enough to jump up! With an endless range from many manufacturers, they are available in a wide variety of materials, sizes and styles. As our kids grow up, room space in your home appears to get smaller. Part of becoming a teenager usually includes the need for more privacy and more of an interest in decor and colour of their bedrooms. To utilise bedroom space more effectively the addition of High Sleeper Beds can improve storage facilities whilst at the same time providing an interesting piece of furniture to the room. They can be made from metal or wood, and come invarious finishes from light to dark wood, or painted wood and metal. There are usually many choices and mattress options which are sure to match the decor and style required for your bedroom.